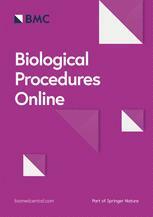 Offering a natural home for novel techniques and methods, Biological Procedures Online publishes improvements and reviews of existing research methods and techniques in biomedicine. Aimed at a broad audience actively involved in laboratory practice, the journal places emphasis on multidisciplinary approaches that integrate methodologies from different areas of biomedical research. Indexed in numerous databases, including but not limited to PubMed and Scopus, the journal will provide high visibility for your research, in addition to undergoing rapid and through peer review. The journal welcomes manuscripts from innovators who have overcome technical challenges or developed new methods.